When the effects of unchecked resource extraction and development are weighed, the burdens fall heavier on communities of color and the poor. The impact of these injustices are far reaching, including compromises in health, economic well-being, and educational outcomes, as well as displacement, cultural erosion, criminalization, and political disenfranchisement. It is time for a radical transformation. Jacqui Patterson explores the intersection of climate science and social justice, and how we can work together to advance equitable environmental preservation. This lecture is free, but advance registration is required. 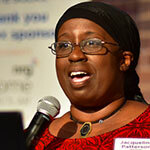 Jacqui Patterson is the director of the NAACP Environmental and Climate Justice Program. Since 2007, Patterson has served as coordinator and co-founder of Women of Color United. She has worked as a researcher, program manager, coordinator, advocate and activist working on women’s rights, violence against women, HIV/AIDS, racial justice, economic justice, and environmental and climate justice. Patterson served as a senior women’s rights policy analyst for ActionAid where she integrated a women’s rights lens for the issues of food rights, macroeconomics, and climate change as well as the intersection of violence against women and HIV/AIDS. Previously, she served as assistant vice president of HIV/AIDS Programs for IMA World Health providing management and technical assistance to medical facilities and programs in 23 countries in Africa and the Caribbean. Patterson served as the outreach project associate for the Center on Budget and Policy Priorities, and research coordinator for Johns Hopkins University. She also served as a U.S. Peace Corps volunteer in Jamaica, West Indies.